Avid cyclists and indoor cycling junkies benefit from wearing cycling shoes. These stiff-bottomed shoes that clip right into the pedals make your ride smoother and more efficient. If riding is a predominant part of your workout routine, cycling shoes are a valuable investment. Cycling shoes' stiff bottoms enable you to transfer more power to every pedal stroke. Because you clip into the pedals, you use more of your leg muscles when you ride. Instead of just hammering down with your quadriceps, you're able to pull up to better engage your hamstrings. This promotes greater muscle balance and, because your muscles are sharing the work, less fatigue. Cycling shoes improve your indoor cycling class rides too by making your stroke more efficient. Whether you ride indoors to train in the off-season or to burn calories, this efficiency pays off. 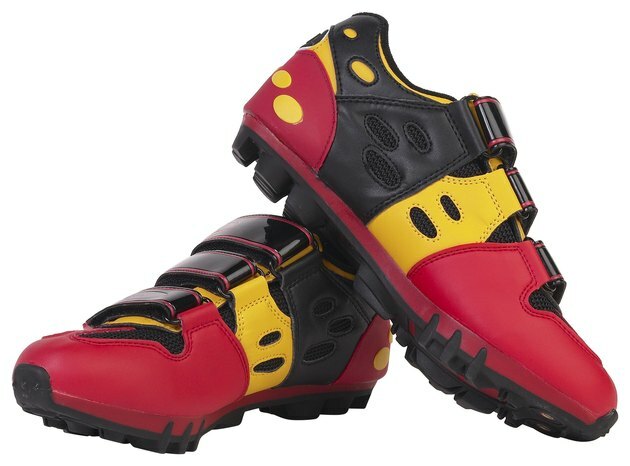 Manufacturers produce cycling shoes from breathable materials. Most versions feature air vents that prevent your feet from sweating profusely and make your overall ride more comfortable. The firm structure of the shoes offers more support so your feet are less likely to cramp. Feet that can breathe and relax mean longer rides, which only help you build stamina and fitness. Cycling shoes and clipless pedals -- pedals that feature a notch into which you clip your shoes directly -- go hand-in-hand. Clipping in and out of the pedals comes with a sharp learning curve, especially if you ride outdoors. Practice near a patch of grass so if the process goes badly, you tip over onto a soft surface. All cyclists -- mountain bikers, road riders and racers -- benefit from clipping in, however, so it's worth the lesson. If you never ride outside and only pop into a cycling class once every several months, you can stick to your tennis shoes. Novice cyclists also benefit from wearing shoes that don't clip into the pedals. You'll have time to become accustomed to riding without having to worry about the added pressure, and possible danger, of clipping in and out. Even if you're just starting out in cycling classes, stick to tennis shoes at first. If you buy cycling shoes and find out indoor cycling isn't for you, you will have just wasted your money on a pair of shoes that'll sit in your closet. REI: Bike Shoes: How to Choose? What Are the Benefits of Cycling Shoes? What Parts of the Body Does Bicycling Work?